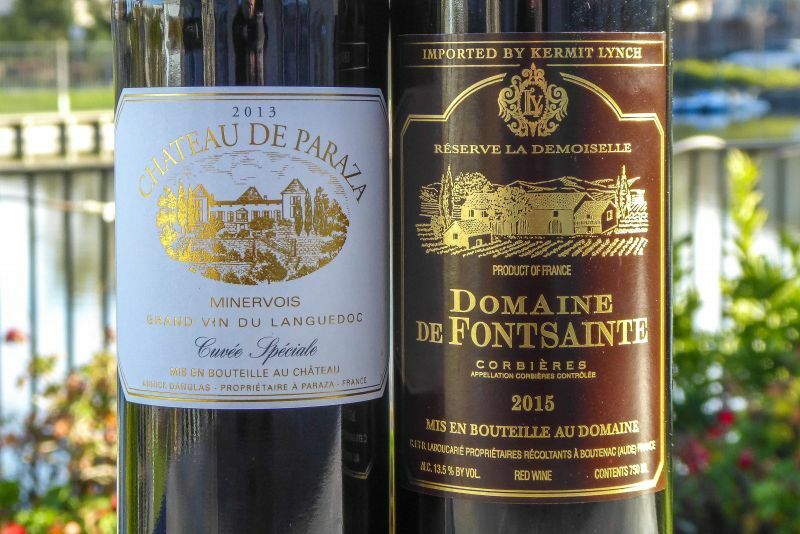 This article was written after we received two bottles of wine from the Languedoc region of France. The Languedoc or Languedoc-Rousillion to give it its full name is a wine producing region in the South of France. The region is not as famous as Bordeaux, Burgundy, or Champagne; however about a quarter of all French wine comes from this area. Karen McNeil in The Wine Bible remarks that this region produces more wine that is made in all of the US and that a century ago over half of French wine came out of the Languedoc. The climate is Mediterranean, literally, as the region is bounded by said sea. The volume of production means that the region has long been associated with inexpensive table wine. 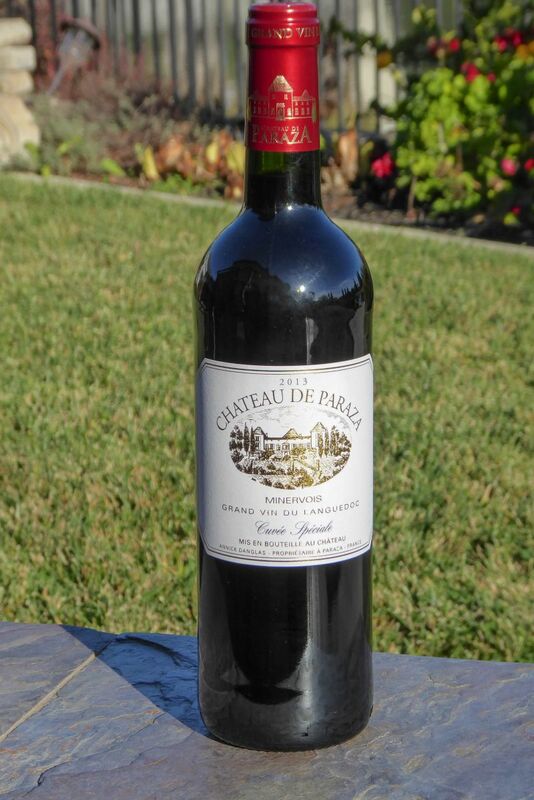 If you ordered a glass or carafe of red wine in a French cafe, the chances are that the wine came from the Languedoc. In recent years, some of the producers in the region have started to focus more on quality. Reputation is hard to shake, so prices tend to be reasonable; making Languedoc a great region to seek bargains. Unlike the aforementioned more famous region whose wines are made from just a few varieties, the Languedoc uses a wide range of varieties. 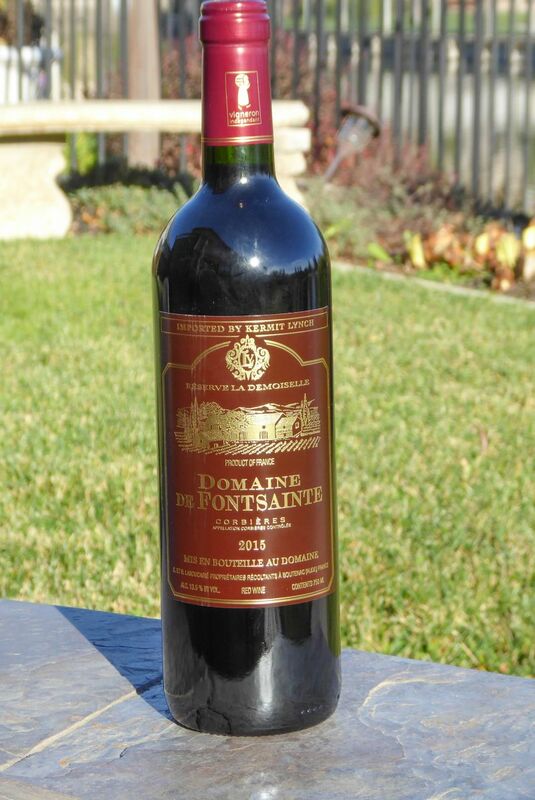 California Girl comments: As this was beautiful full-bodied French wine, I decided to pair it with homemade beef bourguignon. It is an easy dish to prepare but requires a long cook time as it is basically a beef stew with burgundy wine in its sauce. This rich beef stew has the additions of bacon and mushroom to round out the flavor and create depth to the dish. Our first wine came from the Corbieres AOC. This wine is a blend of Carignan, Grenache, and Mourvedre. The wine sells in the US for about $15. The nose was inoffensive, with only a slight hint of fruit. Taking a sip was far more rewarding; medium acidity supported by rich, dark fruit and integrated tannins. Easy to drink, but with enough character to pair well with beef bourguignon. California Girl Comments: For me, there were dusty tannins and a bit of metal and earth to the wine. The forest fruits and cassis on the palate gave this one a bit of interest and made it an enjoyable sip. The second wine was from the Minervois AOC. 40% Syrah, 40% Grenache Noir, and 20% Mourvèdre. Ink-dark in the glass, the nose was of metal and wood; bereft of fruit. Taking a taste there was blackberry at the front, but this was soon replaced by earth and sour milk. The finish was short. Not unpleasant, but far less enjoyable than the previous bottle. This sells in the US for about $12. California Girl Comments: There was a lot of copper in this wine, almost overwhelming the other flavors. I detected a hint of cedar and blackberry, but the fruit wasn’t quite enough to win me over. So glad you were finally able to join us. Your Beef Burgundy, or should I say Beef Languedoc, looks delicious. 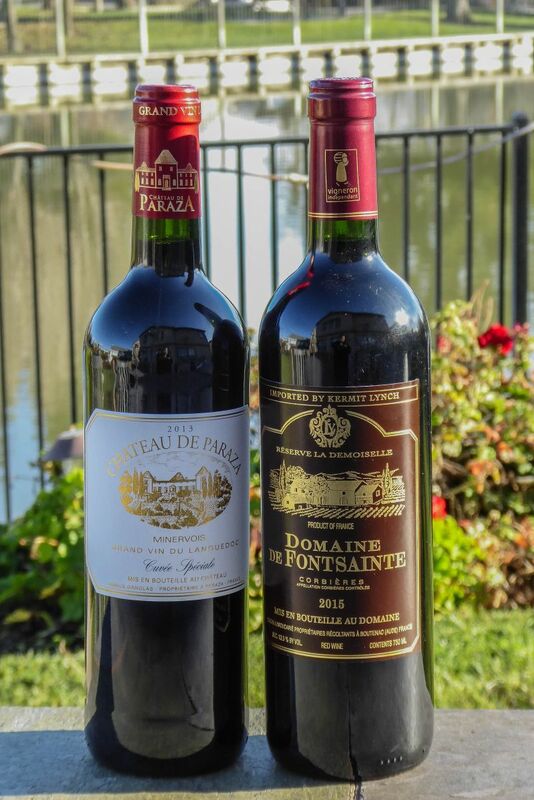 I love beef bourguignon and can easily taste it with these wines. Thanks for sharing. I’m glad one of the wines was worthwhile. I suppose it shows the variability of the Languedoc. Looks like you had some fun tasting these! And some sun in the foto of those beautiful wines (jealous Midwesterner here). This was such an enjoyable topic! 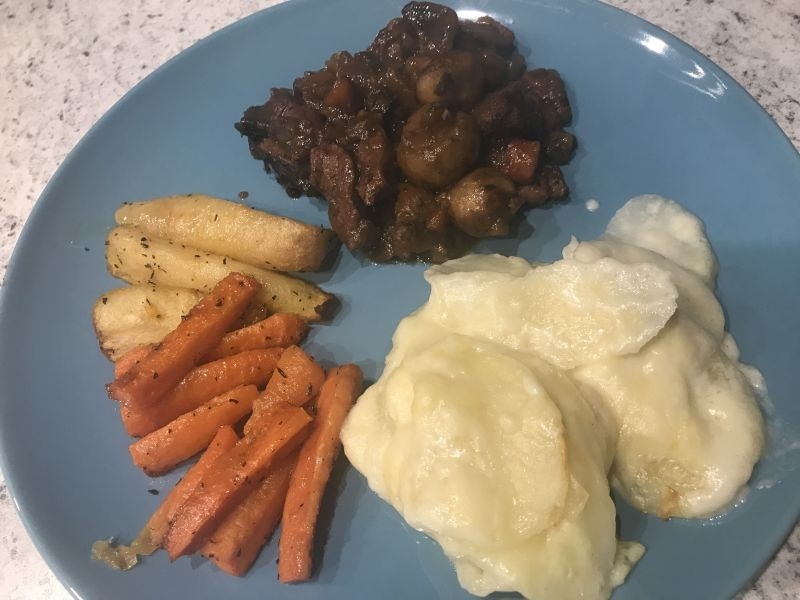 I love beef bourgignon – it makes the whole house smell great for the afternoon! Sounds like the wines were good companions to your winter meal. Cheers! Love the new brand Amber! A nice recap of the Languedoc (aka Occitanie) That Beef Bourgogne looks tasty! Cheers! It’s amazing so much wine is made in the Languedoc-Roussillon. But even better it’s so affordable. Nice to see your Beef Bourgogne paired with the wines, a dish I’ve not made…yet! The Beef Bourguignon looks delicious and I’m sure it would be a great match with the wines. It’s too bad that one wine wasn’t great — but still, at about $12 it’s not a hard hit to take. Cheers!